Man... does anyone else here miss the 80's? "That there is Cundalini... and Cundalini wants his hand back." "This was our first encounter with disco mutants. I was sure it wouldn't be our last." Nice job on the sheet! Gamma World remains one of my favourite games of all time. I even put it as number two on my list of games for RPG BLOG II's top 25 list. Gamma World is a favorite of mine too. I trust you've checked out Mutant Future? On the movie tip, have you seen 1990: Bronx Warriors? Escape from NY + Warriors - Kurt Russell + Fred Williamson! - Baseball Furies + a roller hockey gang + Vic Morrow + cops on horses vs. a girl with a bullwhip = well, less than the some of its parts but better than it has any right to be. 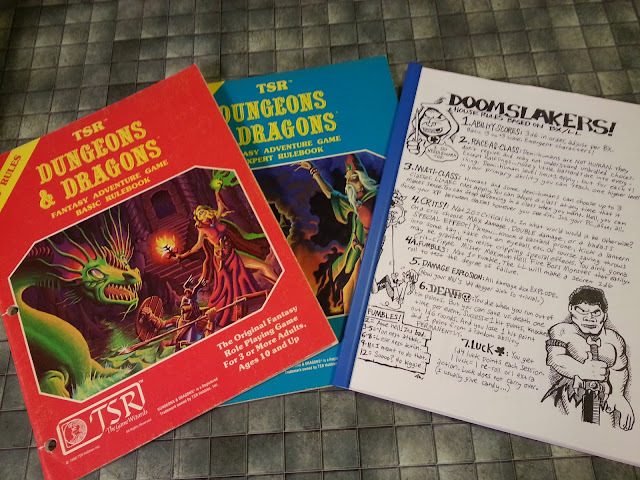 My childhood arc started with DnD, veered into some experimentation with "Top Secret" and "Gamma World", swerved into FGU's "Space Opera", and then into an insane blend of DnD, Arduin, and Gamma World played with heavily modified "Space Opera" rules. Honestly, I've never played GW. 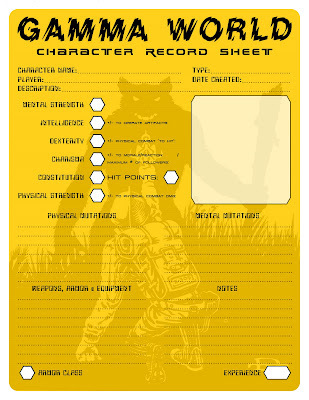 Ever since it showed up in the conversion section of the 1e DMG I've wanted to but the opportunity never presented itself. I don't think I even knew of anyone in my area that played it, though there weren't a lot of gamers in Minnesota farm country. I do plan to check out Mutant Future, though. I think my son will probably get a kick out of it. Probably go a bit gonzo with it. @rpgcharacters: I'm avoiding that meme like the plague (as I tend to do with most internet memes), but I'd probably put it toward the low end of the top 10. @Max: I don't know how I missed 1990: Bronx Warriors. I'll have to see if it's on NetFlix. @Lord Kilgore: I sympathize - my game group has been nearly stagnant for 20 years, give or take. There aren't many gamers in rural central NY either, it would appear. Good luck with your Mutant Future games though.